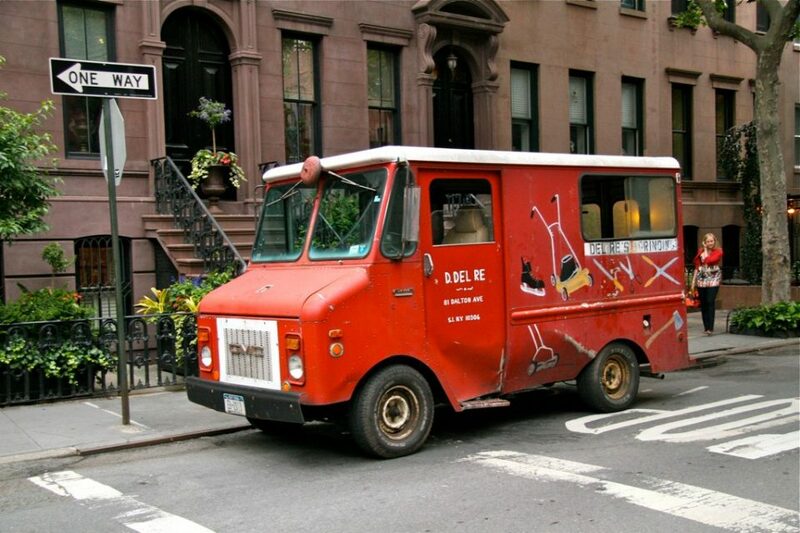 Charming and quaint hand-painted knife sharpener vans are one of the few remaining holdouts from the golden age of hand-delivered household services. 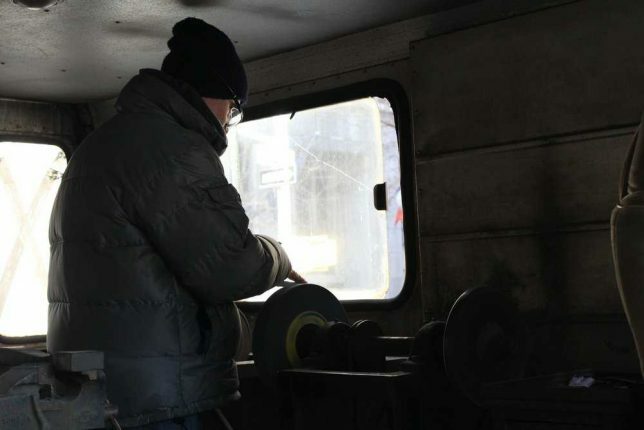 Though many johnny-come-latelies to the age-old trade have employed professional sign writers to decorate their late-model grinding vans, a substantial number of old-school knife sharpeners continue to operate decades-old vans displaying amateur artwork of a similar vintage. 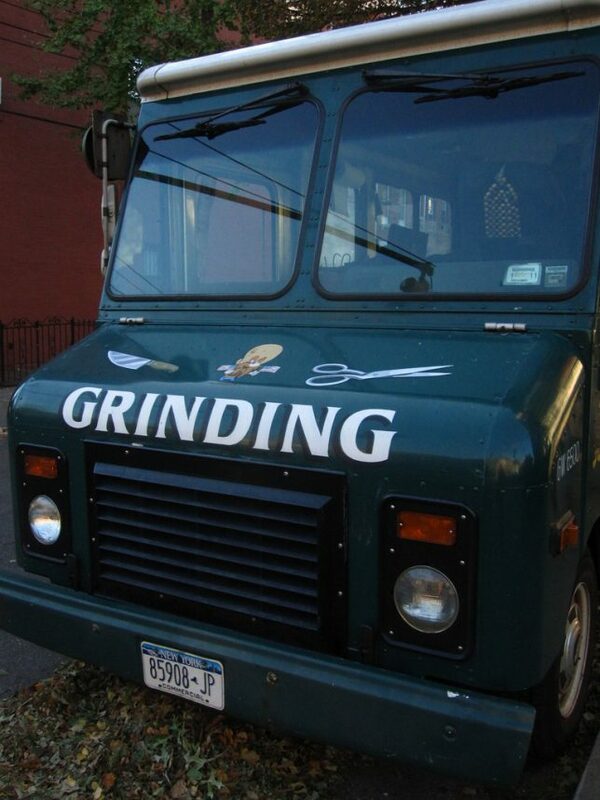 NYC-based Del Re’s Grinding is typical of the genre. 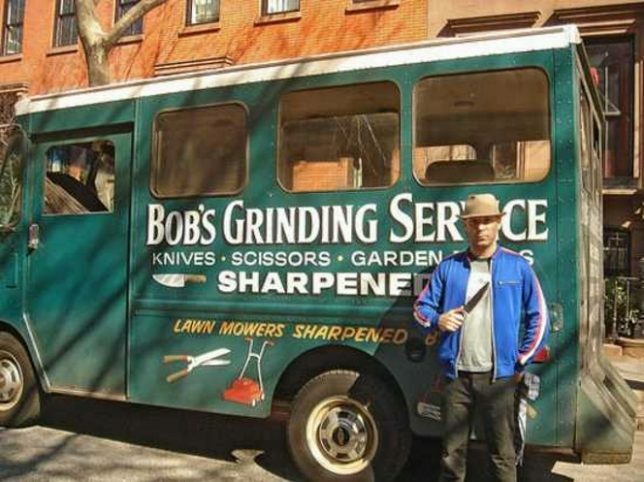 According to The Trowel Tribune, owner/operator Dominic Del Re began his career as a mobile blade grander back in the eighties after leaving his job as a commodities trader on Wall Street. Guess he couldn’t bear the bull anymore. 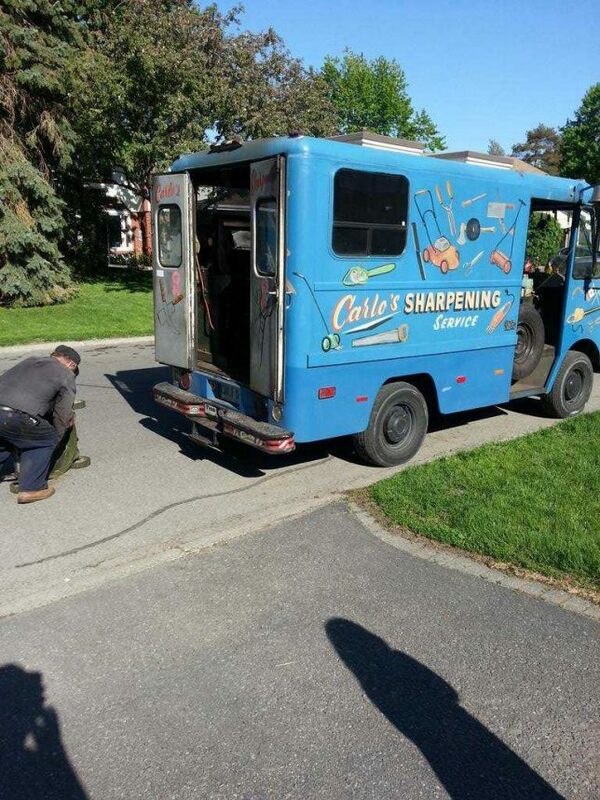 Step-vans and re-purposed bread trucks are often the mobile knife sharpener’s fave choice, as seen by the mobile shop used by Carlo’s Sharpening Service of Ottawa, Canada. 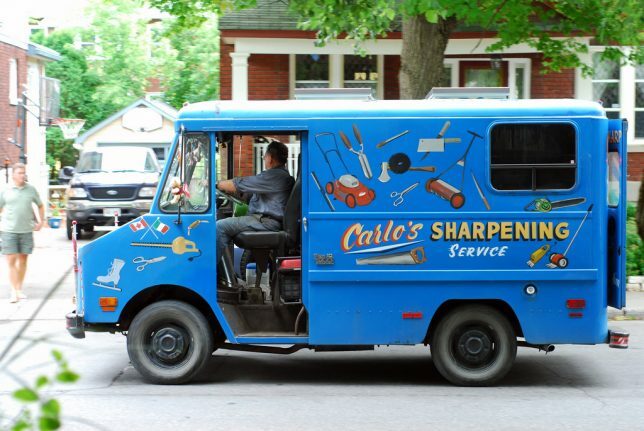 Carlo flaunts his Italo-Canadian pride along with examples of various bladed tools on the sides of his van, as snapped by Flickr member Andrew Codrington (acodring) in 2008 and Twitter member Laura Dudas in 2015. 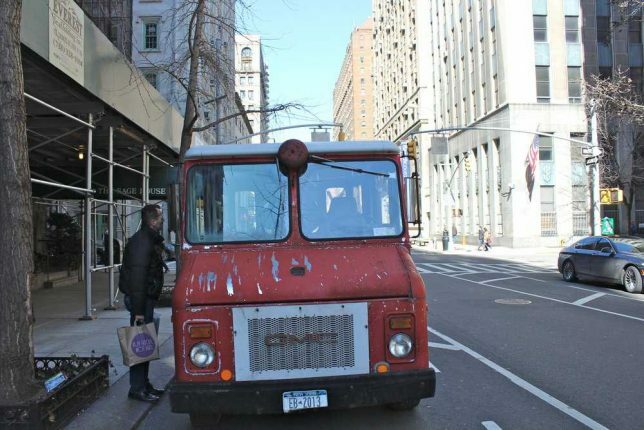 The van’s sun-faded sides pay homage to 7+ years (and uncounted miles) of slow-motion service. 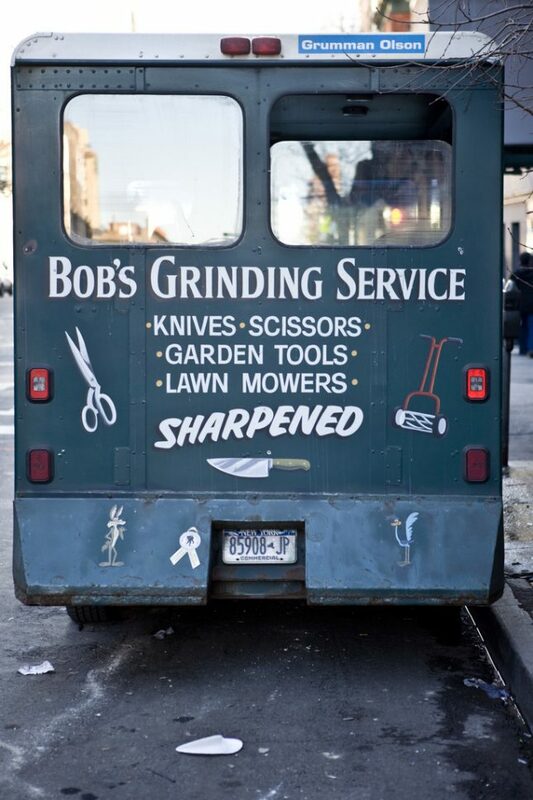 Most mobile blade sharpening services are Mom & Pop-type operations (though we’ve yet to see an actual “Mom” at the wheel – or even riding shotgun), with the owner’s name painted on the van’s sides. As such, one “G. 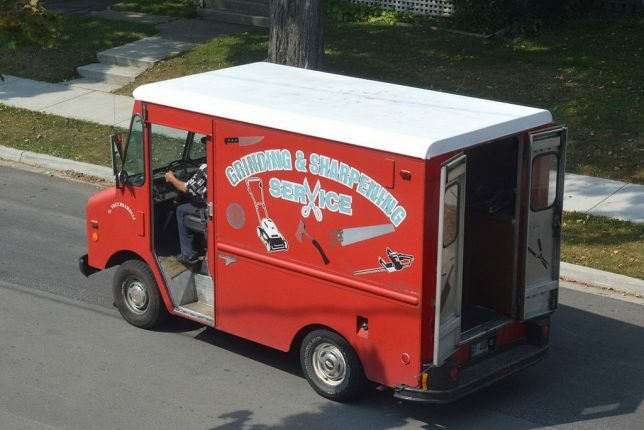 Vecchiarelli” does the needful within his spiffy red “Grinding & Sharpening Service” Grumman step-van – possibly an ex-mailvan – in and around the Greater Toronto Area. Dude better mind his letters, as the sun is beginning to peel them. Flickr member Jennie Robinson Faber snapped the second not-so-sharp photo in early September of 2009. 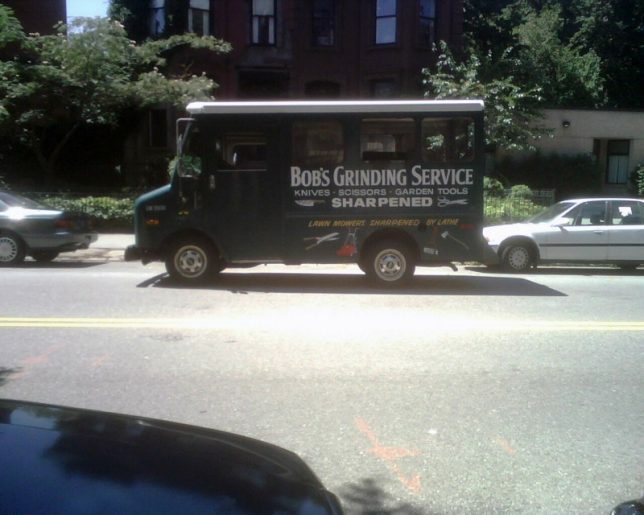 Bob’s Grinding Service has been a frequent sight in and around New York City for many years now. 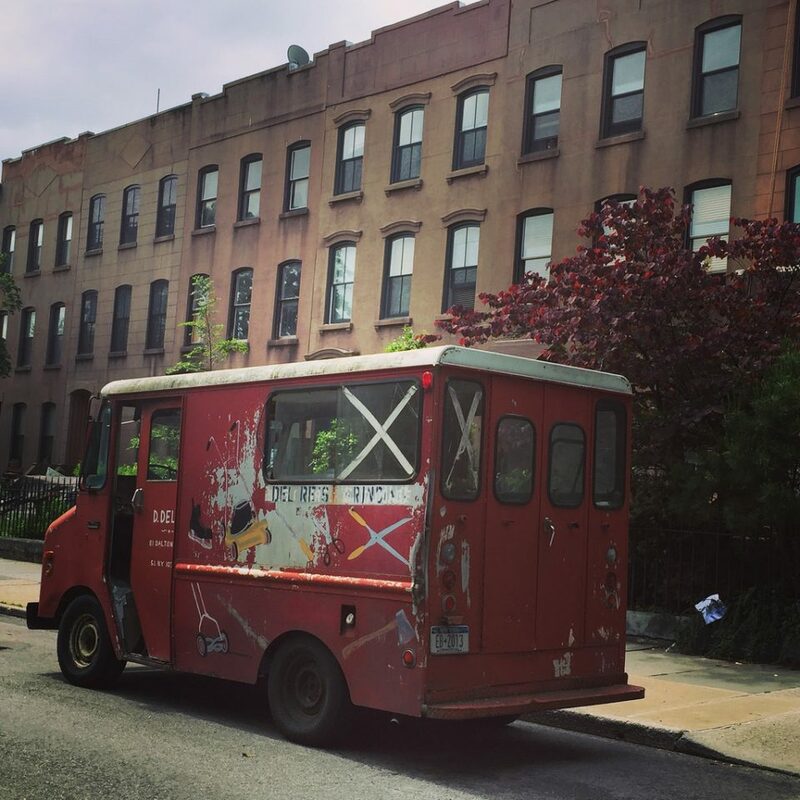 His sharp-looking Grumman-Olson van sports spiffy professional lettering offset by the charming folk-art Wile E. Coyote and Roadrunner characters gracing the van’s back bumper – Tweety-Pie’s painted on the hood. Kudos to Flickr member Nicholas Noyes (niznoz) who captured Bob’s van going away in February of 2008. “This is the second time I’ve seen this truck” states Flickr member Casey Holford (chachlate), who was evidently unaware blade sharpener vans were a thing. 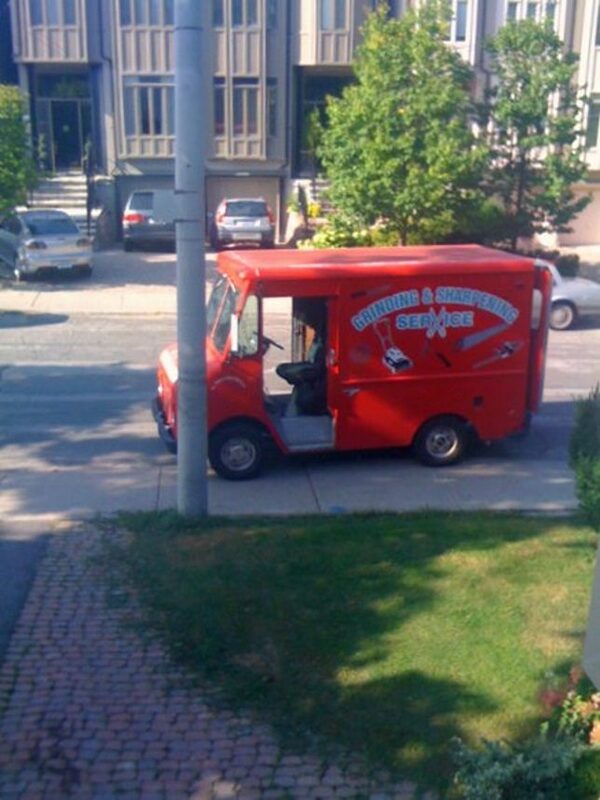 “It apparently drives around and SHARPENS TOOLS for people, just like streetside service out of the truck. There’s a guy in there right now sharpening some tools. It’s crazy.” Crazy like a blade-sharpening fox, Casey.